I was 20 years old, a full-time college student, and minutes away from meeting Terry, one of the greatest friends I would ever have. I pulled up to his upper middle-class suburban neighborhood nestled against the foothills on the West side of Denver and was thinking how much I needed this job—the pay was double my part-time hourly rate at the convenience store and this job sounded much more fulfilling than mopping floors, working a cash register and working for ol’ lady Myrna who was late to relieve me every night at 11 PM when my shift was over. I was nervous about interviewing for a job so unlike any job I’d applied for before. All I knew from my best friend, who worked with Terry’s wife, was that he was in a wheelchair and they desperately needed help. Terry and Penny were hiring someone who would clean, cook, take care of the yard, and do physical therapy exercises with Terry. What did they expect from me? What was it like to work with a disabled person? I was getting my degree in Psychology and wanted to work in a helping profession someday anyway and this was a perfect chance to help someone who needed me. As I walked to the front door, I thought about the phone conversation I had with Terry the night before; he was kind, intelligent and easy to talk to. When I rang his doorbell, Terry came to the door riding his scooter and welcomed me in. We sized each other up pretty quickly and knew instinctively the situation was going to work out well. Terry was in his early forties, balding, with a full beard and mustache sporting a bit of gray. His voice was soft, but deep and his whole face was smiling—eyes twinkling. Sometimes he’d laugh so softly, you’d have to listen very carefully and look in his eyes to tell if he was really laughing. He was wearing sporty slacks and a golf shirt. His scooter-like wheelchair had three wheels and was powered by a car-sized battery with a quiet whirr wherever he went. On the handlebars of the scooter hung a basket with all his accessories—a portable phone, a folding multi-tool, and his wallet. We began to get to know each other and joked around and after a half an hour, he hired me. That day was a new beginning in my life—I spent the next 6 years by Terry’s side. 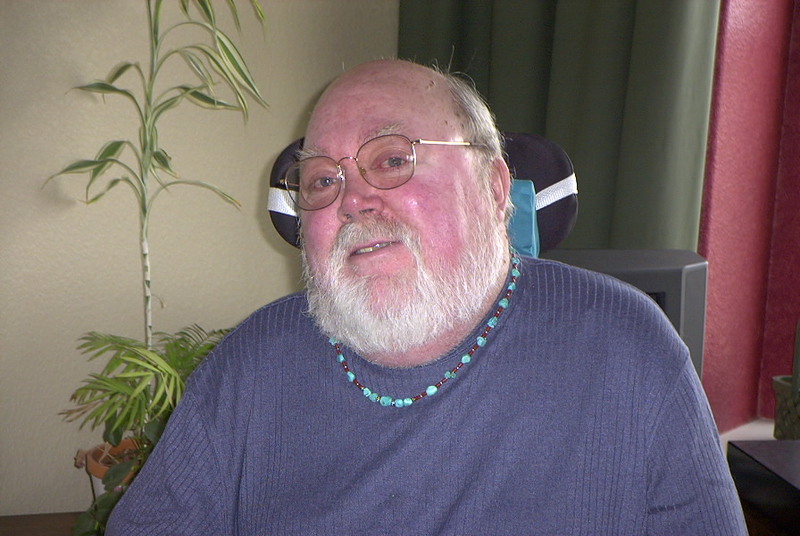 Terry was 28 years old when he was diagnosed with Multiple Sclerosis. When Terry tried to re-enlist in the Air Force, he failed his physical. They claimed he failed the hearing test—he knows now it was the “move your leg around in a circle” test that he really failed. He said his leg was supposed to move smoothly, but the movement was staggered during the test. Months later, he began falling for no reason. Terry went to a doctor. After many tests, they gave him the diagnosis. Having MS meant never having full control over his body, watching his ability to walk fade away, and wondering some days whether he would have the physical strength to pull himself out of bed. Terry lost his military career, lost his 1st marriage, and later, his career in the auto industry, each loss a direct result of his illness—and all in the prime of his life. Terry had been in a wheelchair for about eight years when I met him. I never sensed anger or bitterness about his loss of a healthy body—instead he possessed a joy for life that is rare in most people. Part of that joy was having Penny in his life—his best friend and partner. She really loved him and knew of his illness when she married him, but married him anyway. They were a great team and working in this home day to day offered me a new and profound perspective on life. “Okay!” I’d yell over the wind blowing through the car, “But you are paying for my speeding ticket if I get one!” I haven’t driven a fast beast of a car since, but when I drove for Terry it was to make him feel like he was driving himself. He’d say, “Man, I miss the freedom of just getting in my car and going wherever I want. I miss driving in the New Mexico desert.” I couldn’t give him the desert or his independence, but I gave him my youth and all the excitement and hope for the future that it brings. Other days we spent our days working on the house, Fleetwood Mac’s Big Love pumping out Terry’s huge speakers and expensive stereo system, talking and learning about each other’s history and dreams, waiting for Penny to come home from work so that we could eat the dinner I had prepared with Terry’s guidance. Terry was the mind and I was the body. He verbally walked me through fixing the closet door, changing the oil in the snow blower, hooking up new stereo components, or repairing the sprinkler head in the lawn. My favorite thing was working in the yard. Terry would sip his iced tea on the porch and tap his foot to Robbie Robertson playing over the outside speakers while I pulled weeds or planted in the garden. When we weren’t working, we were philosophizing about life and love and death. I was learning about Abraham Maslow and Peak Experiences in school and we’d talk about Maslow and Jung and any other theorists we found relevant to our emotional and spiritual growth. I read books aloud to him after doing physical therapy exercises, or we fell into a trance listening to a new CD we had discovered earlier that week—maybe Loreena McKennitt or The Blessing. Terry introduced me, a culturally sheltered young woman, to many things in life I had never experienced. Before Terry, the only Asian food I’d ever eaten was La Choy in a can. He and Penny took me out for Vietnamese and I ate rice noodles and learned to love cilantro and lettuce with my egg rolls. And he and Penny took me to my first performance, Phantom of the Opera, and later Miss Saigon. Our Fridays were spent visiting art and nature museums, state parks, and quaint little shops looking for books, incense, or enlightenment of some sort. We drove to Boulder and watched street performers on the Pearl Street Mall and ate cheese fondue at my favorite restaurant. Those were the happiest days in my life. Through this life I began to live in the present moment—the here and now. I didn’t worry about school, or making ends meet—I only lived in the glorious moment of now—Terry did, too. Terry showed me the world—more importantly, he showed me myself. He was the first person that ever demonstrated compassion and total acceptance of me on a daily basis. He would tell me I was one of the most passionate people he’d ever met, that I was good-hearted, and when I felt bad about things, he’d look at me with love in his eyes and tell me he understood me and tell me I was a good person. He had a way of pointing out the truth to me without making me feel defensive. I became more self-aware. He was a mirror, reflecting my true, wonderful self. Soon, I began to see myself through Terry’s eyes and although I battled with a fragile self-esteem, each day I grew into a more loving, compassionate, aware, and self-assured person. Terry and I gave each other hope for the future and he gave me a love for life. I had intended on helping him that day I walked up to his door. Instead, he gave a much bigger gift to a young woman fighting so hard to figure out life—a love for the world and a love of myself. Thank you for reading it and letting me know you liked it! Love this story. I remember you talking about him, and when I met him. He was a blessing in your life for sure. Yes, he was a life-changer for me. It’s a blessing I always appreciate. Terry, you will be missed by so many. You were an old soul who came to teach the rest of us. Know that you succeeded in teaching me, changing me, growing me. Love you. A new essay has just been published in The Rumpus this morning!